I've never quite 'got' Gabriel Byrne. He's always pretty compelling to watch, with that quiet rumble of a voice and the ever-present Irish accent, but there's something a bit 'samey' about the performances of his I've watched. There's no place for him to hide in his role as psychotherapist Dr. Paul Weston in my latest HBO box-set marathon, and I'm happy to say that he's perfect for it, giving at times a masterclass in what you can convey with just your face and no text. Developed from the Israeli television series BeTipul there is a rigid structure to proceedings based on Paul's consulting diary. From Monday to Thursday we see four of his sessions with patients and on Friday, Weston's chance to see his own therapist Gina (played by the quite brilliant Diane Wiest). Each episode is about 25 minutes and by following the stories of the same four patients each week we are given plenty of time to get to know them over the 43 episodes, the kind of character development just not possible in most conventional dramas. The familiar location of Paul's office (part of his home - with its own entrance) creates a reassuring environment so that on the rare occasion when we are not there we feel a little uncertain as the audience, like a fish out of water. When the rules are broken we experience an unease similar to that of the characters. Something similar happens when Paul's family life encroaches on his work. I've never quite worked out if the footsteps I could sometimes hear moving around came from the TV or my own neighbours. Monday is the beautiful anaesthesiologist Laura. Tuesday is alpha-male fighter pilot Alex. Wednesday is teenage gymnast Sophie. Thursday is couple Jake and Amy. I won't go into too much detail about the patients and their problems, that would be the very definition of a spoiler, but suffice to say that each role is cast impeccably (the young Mia Wasikowska - currently starring as Tim Burton's 'Alice' - is particularly impressive as Sophie, giving one of those performances where the acting is 'invisible'), the actors making bold choices that aren't designed to make them sympathetic necessarily. The first week sets things up nicely, making clear the reason for each patients therapy, but of course there is much more to be discussed around the initial reason for treatment. During each session there is a quiet battle, and sometimes not all that quiet, between patient and therapist as one seeks to unearth the answers and the other cannot help but challenge the process and its worth. At the end of that first week is Paul's first session with Gina, a revelation for a couple of reasons. This is the first opportunity we have to see behind the impassive mask of the therapist as Paul vents his frustrations about his patients and the therapeutic process. But also, and perhaps more importantly, the relationship between Paul and Gina is not as simple as you might think. This is not part of a continuous therapy for Paul, in fact he hasn't seen Gina for years. Pushed by his desperation, unable to think of anyone else he can talk to about it, he seeks out Gina with whom he has a troubled history. Watching the two of them grapple with this at the same time as trying to ignore it and be professional makes the final session of the week a constant highlight. We are also watching two actors at the top of their game. Wiest has that remarkable face which seems to smile and grimace at the same time, and there is a marvelous ambiguity to her performance so that we wonder all the time whether Paul has been unfair or not when describing her as a 'sleepy spider'. But Byrne, as I said, is the revelation for me. The largest part of his job after all is to listen and that is where an actor can show just how good he is. No text, no movement, very little facial expression, and yet he manages to convey concern, sympathy, irritation, pain, impatience, even love. For that is the thing that he says he must have for all his patients: love. And that is what makes his sessions with Gina such dynamite. A therapist so involved with his patients naturally has a lot to express during his own therapy, and the complex relationship with Gina causes a kind of intensity feedback loop. Inevitably, over the course of over forty episodes, there are some that aren't quite as good as others and I don't understand why the programme makers felt the need to tie up the loose ends so neatly at the end of the series. I, for one, didn't need such closure. 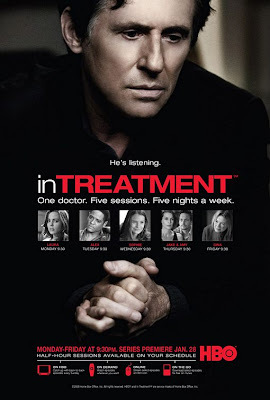 But, these small quibbles aside, In Treatment is an engrossing series, particularly for the focus it affords to each actor, and I'll be keen to see how Paul copes with season two. Nice review, William. We're anxiously waiting for news from SkyArts about the screening of season two, and/or even from HBO about it being released on DVD. In the meantime, a third season is due to begin production in New York in April. Thanks for a refreshing insight into old news for those of us who are ardent fans of Gabriel Byrne. You are absolutely bang on when you describe the many emotions that he can convey in absolute silence. Because of the universal nature of so many of the issues discussed, I have often wondered if, in fact, he did very little acting, and simply, after learning the lines, immersed himself so deeply into the character that he just 'felt' all of those emotions, as he would have as a father, husband and therapist, such that what we see was so 'real'. Does that make sense or is that just what fabulous actors do?! It sure felt like I can imagine him reacting in a real life situation, and frankly like most of us do react. BTW, Season two is even better! Thank you Lozzie. As someone who loves 'anything with Gabriel Byrne' this series must have been 43 episodes of pure joy! It's an interesting point you raise Stephanie. My own thought, which picks up on something discussed over here, has to do with "intensity of listening". You can sort the good actors from the bad (and the great from the good) by looking at what they do when they aren't speaking. Some actors, when they have no lines, just switch off completely. Some do 'reaction' acting where they pull the appropriate face in line with what they're listening to ('Ooh, I'm shocked/amused/saddened/confused'). The really great actors give a focus that serves to support the actor they're listening to and give a truth to their own performance which means that the 'ball' never gets dropped. Having said that we have to remember that this is a TV programme, a medium where the actor himself has very little control over which 'take' will be used in the final edit. It's perfectly possible that what we have accepted is a brilliantly subtle reaction to what his patient has just said is in fact a shot from an entirely different part of the scene altogether! Let's give him the benefit of the doubt though. Looking forward to season two (and three).